Mr. K of AdultFansOfNerf kindly sent me a little insight into the future of VORTEX, and it certainly looks good. 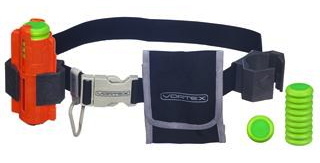 Nerf has created an ammo belt designed specifically for vortex players (like myself). The belt is equipped with two magazine clips, a pouch for extra ammo, and a D-ring for attaching a smaller blaster (Proton anyone?) or another accessory. It also includes one 10-round vortex magazine and 15 discs. It also appears that all attachments can be moved around to suit your needs. Here’s the link to the only place online selling the belt, available later this month with pre-order available now at $15.99. So this is just my curiosity coming out; What do you guys think about the Stockade? 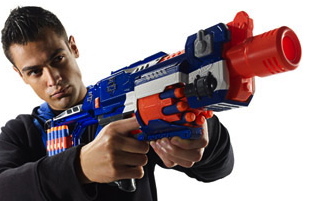 I think Nerf is waiting to see how well the original Elite blasters will sell, and then they’ll decide whether or not to release the Stockade. They may be doing the same thing with the Elite Jolt and the Firestrike (Elite Nitefinder), who knows? The Stockade is the successor to the N-Strike Barricade. No word yet on the range, but I’m sure it’ll be 75 feet. I say that because it’s a flywheel system blaster (just like the Barricade), and I’m sure that whatever new flywheel tech has been put into the Hail-Fire will be in here too. This blaster has a 10-round, auto-rotating ammo drum and I believe it’s semi-automatic. It also comes with a removable stock that can house up to 10 extra rounds of ammunition (5 on each side). It also looks like a beast! So what’s your opinion? Do you love it? Or should it stay under wraps? Side note: I personally think this would make a GREAT sidearm. It just needs some sort of loop to attach a D-ring or strap onto it. I think the new Elite bandolier would look awesome with it. Just my opinion.